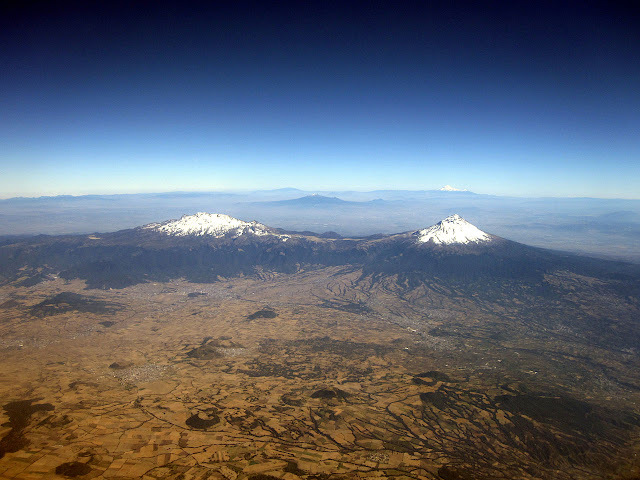 image: Ixtaccihuatl (left) and Popocatepetl (right); Wikimedia commons (link). I remember learning the touching legend of the lovers Popocatepetl and Ixtaccihuatl when I was in high school. It is a Mexicahtl legend from the Aztec Empire (and perhaps earlier as well) which is mentioned in the accounts from the 1500s recorded by the Franciscan Friar Bernardino de Sahagun and which predates the European invasion and destruction of the Mesoamerican civilizations. The story relates that the beautiful maiden Ixtaccihuatl was the daughter of the emperor, and she fell in love with the warrior Popoca. In the different versions of the myth, the emperor says he will consent to their marriage, if the young warrior returns victorious from an upcoming battle (in some accounts, the emperor disproves of the match for his precious daughter, and thus does not intend for the warrior to ever return). Whether or not the emperor was harboring treacherous motives against the young man, in all the accounts the message comes back from the battle that the brave warrior has met his death on the battlefield -- in most versions, this message is falsely dispatched to the capitol by a rival who hates Popoca and wishes to marry the emperor's daughter himself. Ixtaccihuatl is devastated by the news and either takes her own life (with a dagger) or perishes of grief after a short period of intense mourning. When the handsome young warrior returns victorious from the battlefield and is told what has happened, he too is overcome with grief, and -- gathering the body of his beloved in his arms -- ascends into the high mountains beyond the city, where he lays her down and takes up a lonely vigil, holding a flaming, smoking torch as the days and nights pass and the snow and ice slowly cover both Ixtaccihuatl and the bereaved Popoca. Eventually, by the will of the gods, the two become snow-covered mountains themselves -- mountains sacred to the Nahua or Mexicah peoples who lived in what is now central Mexico and who built the Aztec Empire. Sahagun relates that he himself climbed these mountains to observe the ongoing veneration that took place there in the 1500s. In the stunning image above, you can clearly see the outline of Ixtaccihuatl, who looks like a woman lying on her back, draped in snow, at the left of the photograph as we face it -- and beyond is the looming peak of Popocatepetl, who still holds his blazing, smoking torch as he keeps watch over his beloved. Both mountains are volcanos. 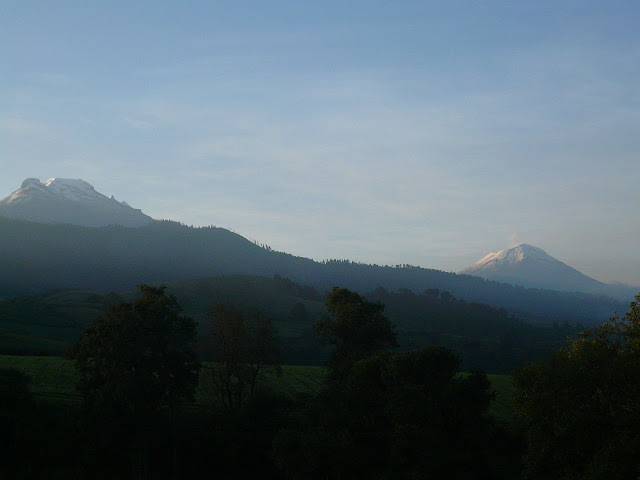 Ixtaccihuatl rises to a dizzying elevation of 17,160 feet above sea level, and Popocatepetl to 17,802 feet above sea level. When I first learned the story of Popocatepetl and Ixtaccihuatl, neither had erupted for many decades. Ixtaccihuatl is usually classified as being extinct. But in 1991, after a half a century of inactivity, Popocatepetl awakened, producing a series of eruptions which continue to this day. Clearly, the steadfast warrior still watches over his beloved Ixtaccihuatl, and he still bears his flaming brand. This week, Popocatepetl began a powerful eruption in which fiery lava can be seen bursting violently out of the mountain, and a thick column of billowing volcanic ash has been pouring up into the sky and leaving a thin coat of volcanic dust over the surrounding countryside and the closest city, Puebla. video above: link. (Note that the most spectacular activity begins after about 4:00 in the clip). Obviously, this is a myth which appears to be completely inspired by the actual sacred mountains themselves: but it is very intriguing to note that in the sky there is also a corresponding set of constellations in which a male figure sits up as if in a vigil over the recumbent form of a female figure in the heavens -- and in between them, not far from the seated male figure, we can also perceive a constellation which does indeed resemble a flaming torch, and which can be shown to play the role of a flaming torch in some of the Star Myths found around the globe (some of which are discussed in my recent series of books, Star Myths of the World and how to interpret them -- examples are found in both Volume One and Volume Two). Note that the female figure (Virgo) is lying down on her back, just as Ixtaccihuatl in the legend, and beside her sits the male figure (Bootes) dutifully watching over her, with his flaming torch nearby (Coma Berenices, or "Berenice's Hair"). At this point, of course, nearly everyone will object that any suggestion of a celestial origin for this moving story of the Aztec warrior and his beloved princess cannot possibly be correct, because we can all see the mountains themselves, towering over Mexico City and the surrounding plains to this very day. Surely this legend is inspired directly from the volcanos themselves, and has nothing to do with the stars! But note carefully that the legend chooses to "see" these mountains in terms of a recumbent maiden and a vigilant lover with a torch -- certainly not the only possible way to frame a myth regarding these two mountains. In other words, the sacred mountains are imbued with a mythical legend which reflects a reality which can also be seen in the heavens above: a pattern often referred to by the meaningful phrase "as above, so below," which can be found to operate worldwide and often at geographical locations which are specifically envisioned as reflecting the celestial realm (such as the River Ganga in India or the region of the Paha Sapa in the Lakota lands in North America). The sacred mountains of Popocatepetl and Ixtaccihuatl thus appear to fit into this very same worldwide pattern. It is also noteworthy to examine the meaning of the names of the two young lovers in the story. Ixtaccihuatl (also frequently spelled Iztaccihuatl) is said to signify the "White Maiden" (from the words ixta or izta meaning "white" and cihuatl meaning a woman or maiden). She is also sometimes referred to as the "Sleeping Maiden" or "Sleeping Woman" -- La Mujer Dormida (perhaps Popo is waiting and watching over her for the day when she will finally awaken to new life and the two can have the happiness together that they were denied for so long). Popocatepetl, we are told by those knowledgeable in the Nahuatl language, signifies "to smoke" or "to be smoking" (popoca) and "a mountain" (tepetl). The discussion of the mountains and their legend in this volume, for instance, notes some other mounds or mountains which also end with -tepetl, such as Tlachihualtepetl. Is it just a coincidence that halfway around the world, the very similar term "tepe" is also used to signify a mound or a hill, such as in the famous and extremely important archaeological site at the mound that had the name of Gobekli Tepe in the southern part of modern Turkey, and which we are told signifies "pot-bellied mound" or "pot-bellied hill"? Advocates of the conventional narrative of ancient human history refuse to admit the possibility that some ancient common source may have influenced cultures all around our globe (or somehow left some kind of memory which was taken in different directions by different cultures down through the subsequent millennia). They would thus dismiss any attempt to draw linguistic connections between "mounds" or "mountains" described by the word tepe in the region of Asia Minor and the use of the very similar word tepetl to describe mountains and man-made pyramids in Central America. And yet, there is abundant archaeological evidence that suggests that the conventional narrative of ancient human history is gravely mistaken (if not deliberately deceptive). An earlier post discussing a site with a similarly outstanding Nahuatl name, Calixtlahuaca, provides links to some examples of the evidence which is generally ignored or disputed or "wished away" by those advancing the conventional narrative. In addition to the formidable archaeological evidence from around the world arguing for an ancient history of the human race far different from what we are generally taught in school, there is also the emerging evidence that the myths of virtually every culture on our planet share a common system of celestial metaphor. This worldwide system constitutes a whole additional body of evidence, very difficult to deny, which argues for some sort of very ancient common source or influence in the very distant past -- so ancient it predates ancient Sumer and ancient Babylon and ancient India and ancient Egypt (all places where the myths can be shown to be using this worldwide system), and yet so widespread that it can be found operating in the sacred traditions of cultures in the Americas and the Pacific and in Australia and in Africa which continued those traditions right up into recent centuries or to the present day. 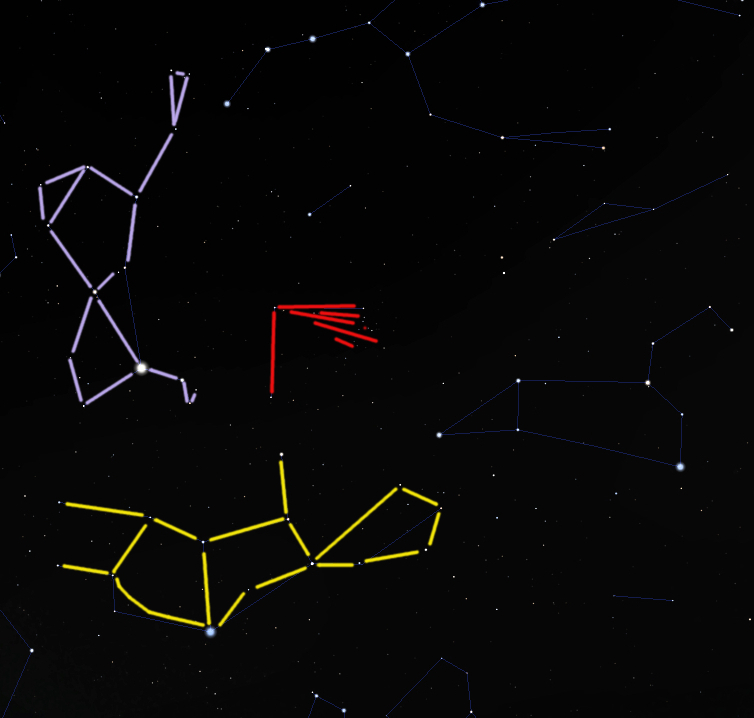 These Star Myths from around the globe constitute a precious inheritance which was bequeathed to the human race at some point in our past. And, as this week's activity of Popocatepetl shows, as he continues to watch over his beloved, it is a living inheritance which is still powerful and active, right up to the present moment. Dionysus, "mighty and many-shaped god"